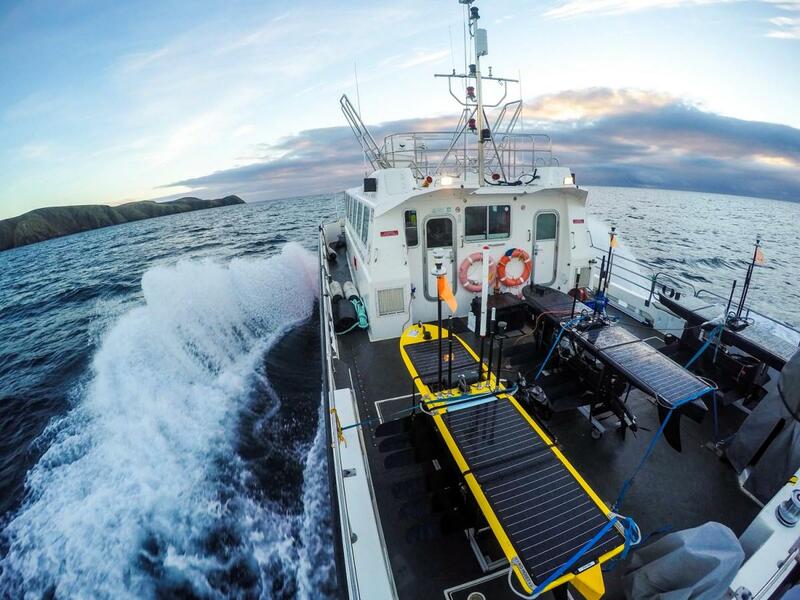 The next phase of the project, an ambitious two-week mission involving ten marine robots has commenced off northwest Scotland. This latest phase sees the largest fleet of vehicles to be simultaneously deployed in UK waters. The fleet of surface and submarine gliders are working together to collect a range of environmental data. 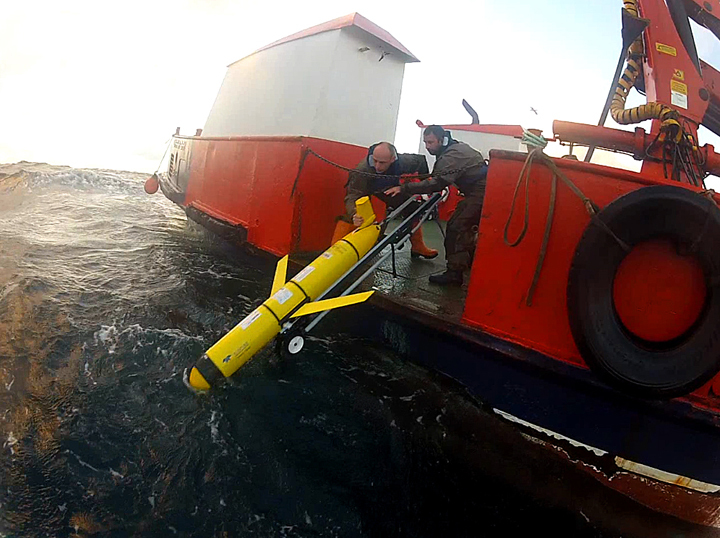 This latest phase is being run in partnership with the Scottish Association for Marine Science (SAMS) and will provide environmental assessment of an area off northwest Scotland to the Royal Navy prior to its ‘Unmanned Warrior’ exercise, as well as being made available to the marine science community via the British Oceanographic Data Centre (BODC). 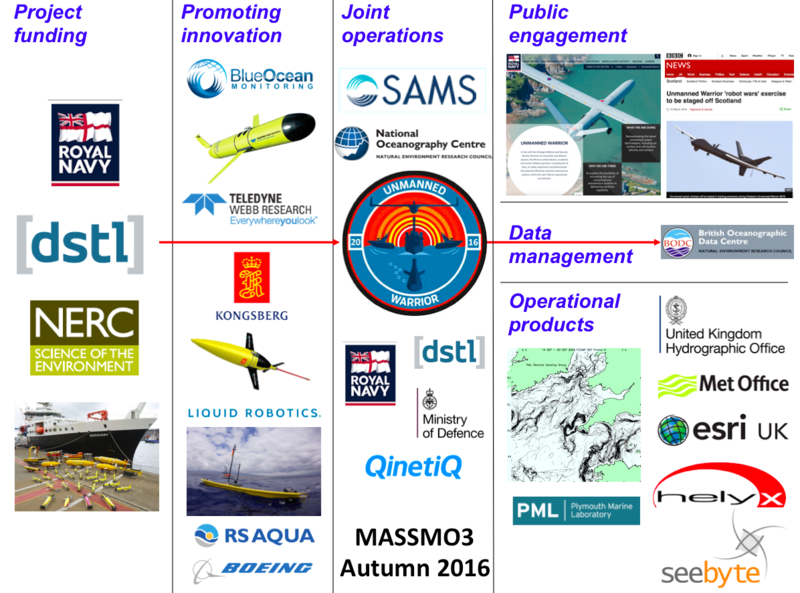 Real-time data is visible via the mission website, and the initial results will be presented at a workshop at the NOC in Southampton on 18 November 2016 as part of the annual Marine Autonomy and Technology Showcase. Fraser MacDonald, who is co-ordinating the SAMS contribution, added: “Since 2009, SAMS has been using marine robots to support international science programmes through our North Atlantic Glider Base and the Scottish Marine Robotics Facility, which has unique access to the deep waters of the northeast Atlantic. Participating as a key partner in this mission is a fantastic opportunity to contribute our scientific expertise and local knowledge”. As well as collecting basic information on ocean temperature, salinity, oxygen, turbidity, and near-surface weather conditions, the gliders will also be measuring ocean currents, water depth, and the abundance of plankton in hotspots such as water mass boundaries (fronts). Some of the vehicles will be travelling over 100 km offshore of the Outer Hebrides, and venturing into waters up to a mile deep. Most of the gliders will be piloted via satellite from an operations room in the Marine Robotics Innovation Centre at the NOC, but some project partners will be piloting their vehicles from as far away as the US and Australia. A primary objective of the mission is to maximise the amount of data transmitted back to the operations room in real-time, to ensure it can be used by Royal Navy and Defence Science and Technology Laboratory (Dstl) staff. Commander Peter Pipkin, Royal Navy Fleet Robotics Officer, said: “It is a great moment to see the largest UK deployment of hydrographic unmanned systems”. Dr Tim Clarke, a Dstl Marine Scientist added: “Dstl is using these trials to prove and demonstrate the capabilities of autonomous vehicles, leading to an improved and efficient maritime capability for the Royal Navy in the future”.